Eating your greens isn't just good luck on New Year's Day — many green vegetables are nutrient-dense, high in fiber and may even help prevent cancer. Next time you visit the grocery store, be sure to stock up on these healthy greens. Broccoli has high levels of vitamin C, vitamin A, fiber and calcium. This veggie belongs to a family of plants called Brassica, which also includes cauliflower, cabbage and Brussels sprouts. Brassica vegetables contain compounds — including including 3,3'-diindolylmethane, sulforaphane and selenium — that may reduce the risk of cancer, according to some studies. Broccoli can be eaten raw or cooked, but be careful not to overcook it — one study from researchers at the University of Warwick found that the vegetable loses up to 77 percent of its cancer-fighting compounds when boiled for over 10 minutes. Try lightly steaming broccoli, and avoid adding cream-based or cheese sauces, which add extra calories. Kale is another Brassica family vegetable with anti-cancer properties. Like broccoli, boiling can decrease levels of anti-cancer nutrients in the leaves, but steaming, stir-frying and microwaving leave them intact. Steaming kale may also improve this leafy green's ability to lower cholesterol and prevent absorption of dietary fat. Researchers have suggested that regular consumption of steamed kale may lower the risk of heart disease. If you swore off Brussels sprouts for life when you were a kid, you may want to reconsider. This vegetable has rebounded in popularity in the past few years, and it packs a health punch. According to an Ohio State University study, Brussels sprouts help the body produce a substance — called indole-3-carbinol (I3C) — that prevents proliferation of cancer cells and may even slow the development of Alzheimer's disease. Try roasting Brussels sprouts, or thinly slice the leaves raw for a shaved Brussels sprouts salad. Spinach is relatively low in calories but high in vitamins A, C, E and K, as well as iron and calcium. 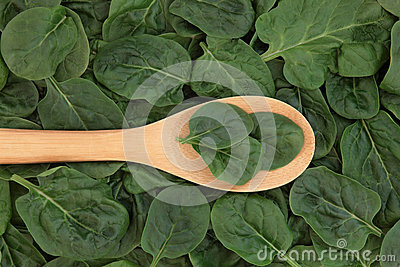 Spinach also is a good source of folic acid, an essential vitamin, especially for pregnant women. Along with those benefits, a recent study showed that spinach may improve cognitive control. The leafy green contains tyrosine, an amino acid that keeps the brain sharp. Collards are another nutrient-dense Brassica vegetable that has anti-cancer properties. A close relative to kale, collard greens contain high doses of vitamins A, C and K. Although some collard green recipes require bacon grease and lots of salt, these greens are tender and delicious when steamed and seasoned lightly. Alternatively, you can use collards to turn an ordinary wrap into a nutrient-dense one — just substitute a large collard leaf for the tortilla. "To enhance the nutritional benefit of green vegetables, variety is helpful as with any food," Deborah Gordon, MD, said in an interview. "All of our food contains nutrients and some nutritional detractors, so a wide variety is the best way to cover your nutritional needs." Dr. Gordon, who is a nutrition, homeopathy and family practice expert, also emphasized the importance of the source of green veggies. "Buying local will enhance the vitamin and mineral content of all foods," she said. Still wary about integrating these greens into your diet? "If the brassica vegetables and spinach seem like strong flavors to you, mix them up with the milder greens, such as romaine or leafy green lettuce or steamed chard, until you develop a taste for kale, collards and brussel sprouts!" Dr. Gordon suggested. Some of the best preventive medicines can be found on a plate, not in a pharmacy. Including these green vegetables in your meals is a heart-healthy way to get a dose of anti-cancer nutrients.